Bul-Bul Tarang Gang packs a punch. Their Kali cassette released under the Sloow Tapes label symphonically channels the creator and destroyer, Indian Goddess Kali, the “black night.” Kali blurs together the sounds of harmonium, bass, dholak, emphatic percussion, and the bul-bul tarang. The bul-bul tarang is played by Buffalo’s Ravi Padmanabha, who is known for his collaborations with saxophonist Steve Baczkowski and also his brotherly trio, the Family FUNKtion and the Sitar Jams. The gang here—which features FUNKtion brothers Naryan and Aneal Padmanabha on percussion (along with Bill Conroy), Micheal McNeill on harmonium, and Ed Kalvoon on bass—takes the listeners on an exotic set of raga-infused meditations from the otherworld which yield an incredibly unique, stimulating experience. There is a constant meditative thread that runs throughout each piece. The melodies are stirred, allowed to rise, and then simmered back down, all collaborating nicely off one another. Ravi’s sound on the bul-bul-tarang is likely to impress and is something that many may have not encountered before. Albums that have a concept and stimulus are fascinating, and I believe that Kali captures a wide-range of the goddess’ forms and emotions. “Kali Part I” warms up with a lingering introduction to all the instruments one will hear throughout the album. A few minutes in, they begin to crash and meld into one another, as the image of Kali stepping onto the battle ground, rattling up the army, is conjured in the listener. The percussion glides swiftly. Around five minutes in, the harmonium and percussion create a steady, entrancing, andante beat. In the foreground, the bul-bul tarang is sharp and spirited, while the percussion provides spacious support, lifting the harmony from the darkness. 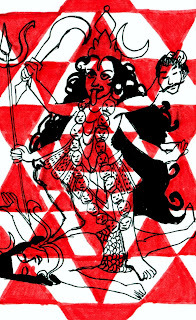 The sounds of the bul-bul-tarang–which translates to “a wave of nightengales”–lives up to its name and leads the listener through sonic chaos, crooning for Kali and singing her praises. Toward nine minutes in, the pace runs and intensifies becoming more stilted and frenzied. After a few minutes, the bass splinters out, the bul-bul tarang quiets as “Kali Part I” ends. The blood has been spilled. “Kali Part II” picks up with the tarang playing a steady raga. The pace is controlled, no stray elements linger. Perhaps Kali has stepped on Shiva, her consort, and her tongue has flicked out in shame. The tarang rumbles on and the drums become stronger, eerie, and seductive. As the song progresses, it becomes more meditative; the harmony appears nostalgic, as it returns to the dark from whence it came. The tarang softens as the bass bounces, calming the music, dampening into the mist. Out of the darkness must come light, of course. Sarasvati, the river goddess whose knowledge Brahma used to create the universe, is a great contrast to Kali. As we know, energy is neither created nor destroyed. Chaos brings creation. The track invokes Sarasvati’s flow. McNeill’s harmonium strums along as Klavoon’s bass plops steadily, like a water’s ebb. Each component is patient, trickling. This is a refreshing, relaxing ride between journeys. We aren’t peaceful for very long, though. “Nagin A” and “Nagin B” channel Naga’s, the snake spirits, half serpent and half man, who are harbingers of drought and famine, and also contain the fluid of immortality. In the opening, the tarang slithers through the pensive, enchanting beat. Toward the climax of the album, the drums created by the trio of percussionists gives off an intense heat. A great wisdom is subtlety being imparted—the flux of life is ever-changing. At the climax, the tarang jumps octaves, ending with the fluctuating, wavering harmonium, decresendoing into silence. It is said that to be a child of Kali is to be denied of earthly delights and pleasures. Kali refrains from giving that which is expected. This very refusal to do so enables her devotees to reflect on dimensions of themselves and of a reality that goes beyond the material world. The Bul-Bul Tarang Gang establishes a medium to convey the transience of this message, a seamless, wavering, powerful album that reflects on many aspects of the self, while providing an entertaining and spirited symphony.